Noah loading his current oven, a spanish Llopis with a revolving hearth! 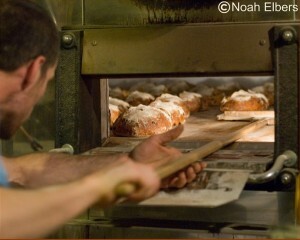 Elbers owns and runs The Orchard Hill Bakery in New Hampshire. He participates in the brickoven group on yahoogroups, which is where this comment came from, but as you can see from his website, he’s clearly spending more time baking and building than computing….HOORAY! For a lovely story about him and his bakery (by a lovely French lady), go here. For fascinating documentation of the installation of his Llopis oven, go here. When I was just starting out commercially I baked in a minimally insulated, 4-5″ thick cob/clay oven. Here was my schedule and quantities just to give you an idea. This was a 5 foot deep oven, 3 ‘ wide app. but scaling up or down does not affect the number of loads much at all. I would fire the oven from cold at 4:30 am. With three stokings (a brisk fire most of the time) the oven was fully saturated by 10:30 am. 2 loads of cookies or bars (totaling 150 pieces) sometimes pies, but not always, up to 15 on a regular basis, but over 100 at thanksgiving and christmas. By the end of the next day the oven had cooled enough to dry fruit like apples and plums, or herbs and tomatoes from the garden. Three days after sweep out the oven would be back to air temp. Light up was very easy in this oven even from cool temps since it heated so fast, wood quantity was miniscule compared to my later AS design, and baking quality when I was within it’s production capacity was better I feel. 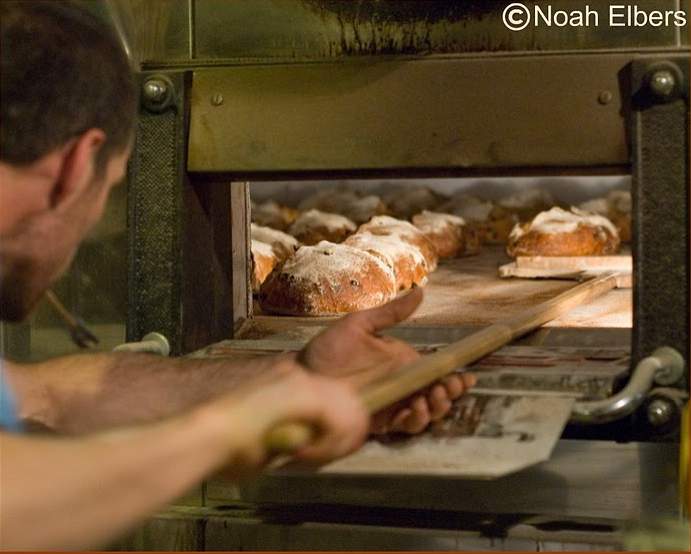 When I built the AS oven, a 4X6, I routinely baked upwards of 700 lbs of dough on a single firing, (500 loaves) and a few times over 1000 lbs of food (bread plus wedding catering). Those things when properly heated can really hold on to some heat, but until they are nice and soaked with heat (something I didn’t fully appreciate until after two years of baking in it) I don’t think they bake very well. When I retired my AS it took well over a month for it to come back to room temp. Amazing, but not useful for home bakers. The other downside of the AS design for home use I think is that once the thing is fully heated, you either need to wait a long time before it enters the lower temp zones better for more delicate things, or you need to have huge amounts of food to bake. The low mass oven will drop lazily but steadily once it is up to full heat, and in a matter of hours you can go from great pizza to great lemon meringue pie. Half an hour at pizza temp, 2 hours in the bread zone, 5 hours for cookies and desserts, 12 hours for braising and roasting, 24 hours for drying etc. I found Noah Elbers’ experience with cob and AS ovens very interesting and instructive. It’s taken me a little practice but I have found that it’s really important to get the oven “saturated” – hot enough – as Noah says. This oven, which is only 36″ in diameter inside with walls about 4″ thick plus another 4″ of fiberglass and insulating concrete, takes about three hours to get “saturated” to about 1,200 degrees – or whatever temperature burns the inside clean and my 1000 degree thermometer is pegged. Since it is lighter (and smaller) than Noah’s cob oven it heats up faster but also cools down faster so that after four or five hours it’s only about 400 degrees.